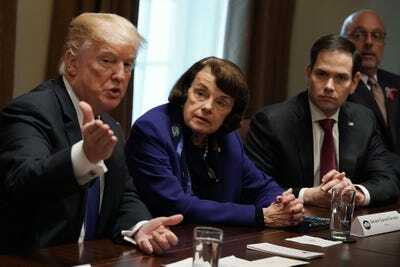 Alex Wong/Getty ImagesPresident Donald Trump speaks as Sen. Dianne Feinstein (D-CA) and Sen. Marco Rubio (R-FL) listen during a meeting on gun control with bipartisan members of the Congress at the White House on February 28, 2018. But how such a ban would actually work – and which guns would be categorized as an assault weapon – remains unclear. But how such a proposal would actually work – and which types of gun would be included in the ban – isn’t entirely clear. Last year, Democratic Sen. Dianne Feinstein introduced the Assault Weapons Ban of 2017, which would outlaw the “sale manufacture, transfer and importation of 205 military-style assault weapons by name.” Feinstein said more than 2,200 other types of gun would remain legal. Trump’s apparent endorsement of aspects of a ban on assault weapons is a stunning reversal for a Republican president. Feinstein even cracked a smile and appeared to be gleeful about the suggestion. While it puts him at odds with the National Rifle Association, a powerful gun rights lobbying organisation that supported Trump’s presidential candidacy, it also pits him against fellow Republicans, who have long opposed restrictions on buying firearms. 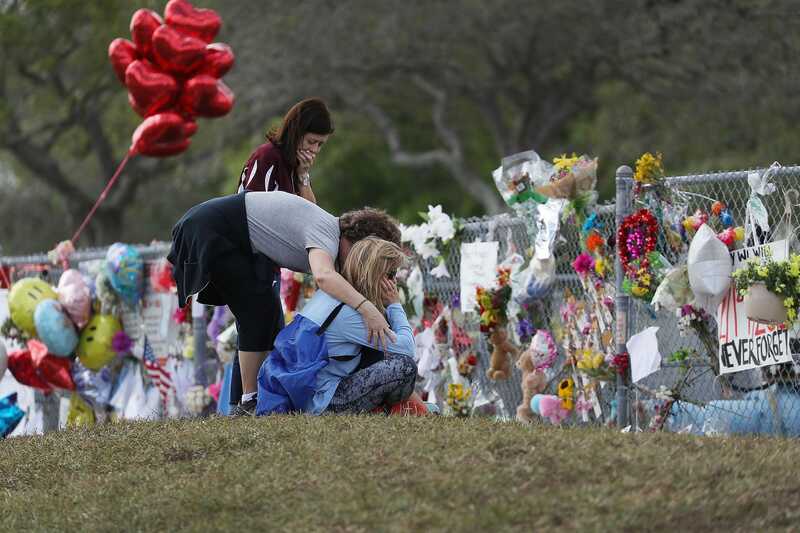 Getty Images/Joe RaedleThe Marjory Stoneman Douglas High School memorial stretches for acres. During a CNN town-hall event featuring students who survived last month’s mass shooting at Marjory Stoneman Douglas High School in Florida, Republican Sen. Marco Rubio explained why he didn’t think Feinstein’s bill would not save lives. “If I believed that that law would have prevented [the Florida massacre] from happening, I would support it,” Sen. Marco Rubio said in response to a question from Fred Guttenberg, whose daughter Jaime was killed in the Florida shooting. The problem with Feinstein’s bill, Rubio added, is that while it would ban more than 200 specific models of guns, thousands of others that are “identical in the way that they function, in how fast they fire, in the type of calibre that they fire, [and] in the way they perform” would still be legal. Rubio’s suggestion was clear: A ban on assault weapons, without an explicit definition of what an assault weapon actually is, would inevitably infringe on Second Amendment rights. Drew Angerer/GettySen. Dianne Feinstein spearheaded an assault weapons ban in 1994. 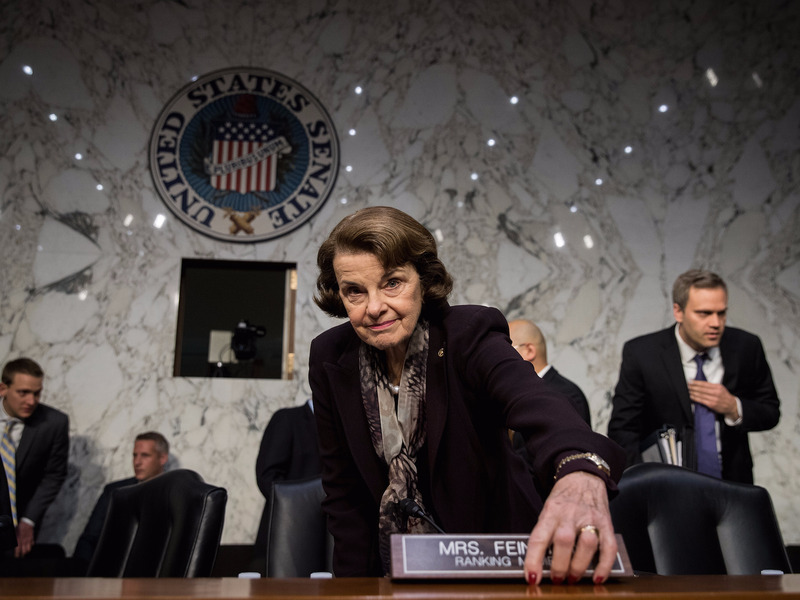 Feinstein’s latest proposal to ban assault weapons isn’t the first time the longtime senator from California has pushed for limits on which guns Americans can buy. That same year, researchers at the University of Pennsylvania submitted their assessment of the ban’s effectiveness to Congress and predicted what would happen if it were extended. An assault weapon “is a fake term exploited by the gun prohibition lobbies,” David Kopel, a policy analyst at the Cato Institute and adjunct professor at the University of Denver College of Law, told Business Insider. But this nuance has done little to convince many Democrats that an assault weapons ban wouldn’t work. Feinstein, for example, has argued that the 1994 AWB expired too soon and would have eventually proven to reduce gun crime if the ban was renewed.